Early County's courthouse and its environment illustrate the dramatic visual impact that can be achieved when architecture and city planning work in tandem. The Neoclassical Revival structure, designed by Atlanta architects Morgan and Dillon and completed in 1905, stands squarely in the center of Blakely's town square forming, as one observer has noted, a kind of architectural paperweight that anchors the town to the land. Lesser buildings face it on all four sides, creating a pleasing enclosure, an outdoor room, in which the courthouse is an elaborate centerpiece. 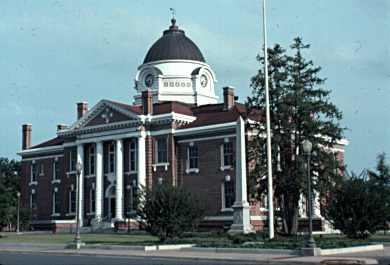 Further, where trees are lined up with the center of the square, the courthouse provides an impressive focal point as one travels toward it. Note that the courthouse has entrances on all four sides. This arrangement treated businesses on each of the facing blocks equally. On the grounds are a couple of curiosities, a Civil War flagpole and a monument to the peanut. The latter, erected in 1954, consists of a large peanut carved of stone atop a pedestal. An inscription notes the economic value of the legume to the area.